Whoa! I have now received not one, but TWO domovoi postcards through Postcrossing this year. The first colorful postcard came in April, from Masha in Sevastopol, Ukraine. And this week I received the above postcard from Alena in Belarus. "Traditionally, every house is said to have its domovoi. It does not do evil unless angered by a family’s poor keep of the household, profane language or neglect. The domovoi is seen as the home's guardian, and he sometimes helps with household chores and field work. Some even treat them as part of the family, albeit an unseen one, and leave them gifts like milk and biscuits in the kitchen overnight. To attract a domovoi, you would go outside of your house wearing your best clothing and say aloud 'Grandfather Dobrokhot, please come into my house and tend the flocks.' To rid yourself of a rival domovoi, you would beat your walls with a broom, shouting 'Grandfather Domovoi, help me chase away this intruder.' When moving, some might make an offering to the domovoi and say 'Domovoi! Domovoi! Don't stay here but come with our family!' It is said the favorite place for these spirits to live is either the threshold under the door or under the stove." There are variations on the spelling of domovoi in different countries. In Belarus, they are called damavik. 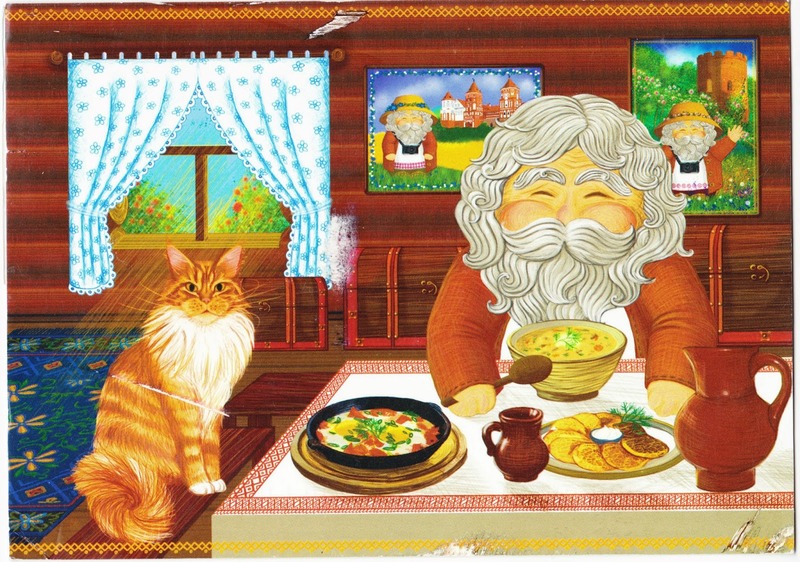 "I hope you enjoy this card with Damavik and Kuzya the cat. Damavik is a kind of Belarusian folklore character, relative to a house elf, or brownie. If the family is kind to him, he helps with household and protects the house. Here, Damavik eats mushroom soup, draniki and scrambled eggs, while his family is on vacation to Belarusian tourist spots (Damavik has already been there; pictures from the journeys are on the wall behind)." Alena adds that more of these postcards can be found on Vanilla Tree Vale Cards' Facebook page. In other domovoi news, I also discovered last night that a folklore-heavy graphic novel called Domovoi, written and illustrated by Peter Bergting, was published earlier this year by Dark Horse. I'll have to check that out!